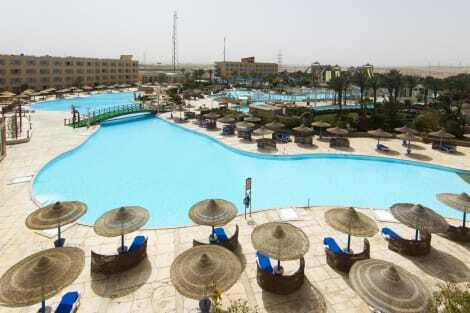 Hawaii Le Jardin Aqua Park Resort is a good accommodation choice in Hurghada. The property boasts location within 10 km from Hurghada city center. The Resort is modern with 5 floors featuring comfortable rooms that come with a mini bar, climate control, a safe, a private balcony and a dining area. Some rooms have sea view. The rooms are designed with standard décor and have marble floors. This luxurious newly renovated, 5-star resort is set among a picturesque garden landscape overlooking Hurghada’s coast and the Red Sea. Just a 2-minute walk to the beach it boasts 2 large outdoor pools and a private beach area. Check-in time: 15:00, Check-out time:12:00. Late check-out is subject to availability after 18:00 the full room rate will be charged. These rates are intended for use by European nationals. Other nationalities are subject to additional charges levied at the time of check in. Situated on 25000 Square meter surrounded with pristine picturesque natural landscape, Beach front property an ideal Romantic gateway for couples as well as for families and legendary for providing distinguish guests. Located directly on the famous El Kora road,only 4 km from Hurghada International Airport and 8 km from Hurghada down town exotic places. picturesque natural landscape, Beach front property an ideal Romantic gateway for couples as well as for families and legendary for providing distinguish guests with high class service. Approx. 32 m2, Telephone, Satellite TV, hair dryer, Mini Bar, Kettle (tea & coffee facilities) individual air condition, Bath room with Bath tub, Balcony or terrace. These rates are intended for use by European nationals. Other nationalities are subject to additional charges levied at the time of check in. Hawaii Riviera Aqua Park Resort situated 11 km north of Hurghada, features three swimming pools and a private beach. It also offers an entertaining Kids Club. This hotel is about 14 km away from Hurghada Downtown and within 10 km distance from the city center. For a comfortable stay, the Hawaii Riviera Resort offers 434 rooms on 5 floors featuring individual climate control, satellite TV, central heating, a laptop-compatible safe and a fridge. The rooms have a view over the sea. Bathrooms in these bright rooms are fitted with a shower, a hairdryer and bath sheets. Check-in time: 15:00, Check-out time:12:00. Late check-out is subject to availability after 18:00 the full room rate will be charged. These rates are intended for use by European nationals. Other nationalities are subject to additional charges levied at the time of check in. 4 star deluxe situated in the heart of Hurghada directly on the blue water of the Red Sea with a spectacular view of the Red Sea islands and it is really a magic stop over for the lovers of the sea diving and relaxation. Located in Sheraton road – Hurghada, Red Sea. Enjoy the feeling of coming home just a bit better… Our beautiful hotel has a total of 711 rooms. These rates are intended for use by European nationals. Other nationalities are subject to additional charges levied at the time of check in. Located only at 17 km from center of Hurghada, and 8 kilometers from the airport, Titanic Resort and Aqua Park offers all the comforts of charming Red Sea resort with a unique combination of casual elegance and affordability. You will find something for everyone at Titanic Resort and Aqua park, whether you are planning an active holiday or family vacation combiend with a most exquisite theme of water sports and leisure. Laundry Service, Hairdresser, spa, Clothing iron service, Room service, Sauna, Wellness center are with extra charge. One of the largest aqua parks in Hurghada, Gross area around 15000m2 total 30 waterslides with 14 for adults and 16 for children, attractions in the aqua park pool with artificial wave, rafting river with whirlpool, slide Zig-Zag slide- flying boats, slide, private sandy beach (left from the Jasmin Beach hotel), distance :700 m with free shuttle service from reception to thye beach every 30 minutes from (08:30 till 18:00) leanth of the beach: 200m. These rates are intended for use by European nationals. Other nationalities are subject to additional charges levied at the time of check in. Plunge into the pleasures of the 4-star Mercure Hurghada Hotel - literally! Explore some of the most spectacular coral reefs in the world at this all-inclusive holiday resort on the edge of the crystal-clear Red Sea. If you love the sun and sports, this is a perfect destination: there's everything from scuba diving glass-bottom boats to daily activities with the hotel team. You can also enjoy the pool, tennis, and squash before dinner or cocktails in one of our seven restaurants and bars. Located in the heart of the popular resort town of Hurghada with uninterrupted sea views, the Hilton Hurghada Resort hotel has everything you need to make your Egyptian vacation a success. Take a swim in one of the hotel’s 3 pools or head to the resort’s own private beach where you can bask in the sun or relax in the tranquil waters of the Red Sea.The hotel’s water sports center and the dive school give guests the opportunity to experience everything this seaside resort has to offer. Those more at home on dry land will appreciate the extensive leisure facilities which include a fitness center, tennis courts and squash courts. The choice of 11 restaurants and bars which cater to all tastes along with the kids’ club program and 2 playgrounds make the Hilton Hurghada Resort hotel the perfect place to visit as a family. Jungle Park Hurghada offers all the comforts of a charming Red Sea resort with a unique combination of casual elegance and affordability. Jungle Park Hurghada offers modern hotel facilities and services for a perfect 'all inclusive' holiday. Overlooking the Red Sea, the Hilton Hurghada Plaza Hotel offers breathtaking views. 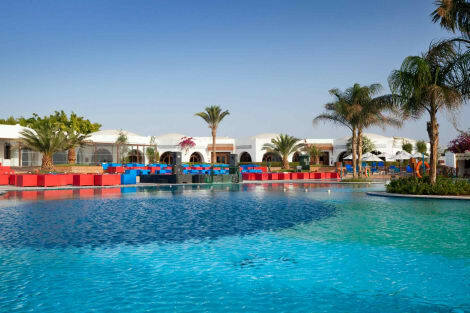 Located on a private beach, the resort is just three minutes from downtown Hurghada, Egypt. Hurghada International Airport is 15 minutes away.Savor sea views on the balcony from all 220 guest rooms and suites at this waterfront resort. From casual beachfront dining to romantic candlelit meals, the resort offers a wide choice to suit all occasions. Refresh by the pool with hearty snacks or indulge in gourmet cuisine while gazing across the Red Sea.Spend leisurely days on the private beach and enjoy diving and water sports in the Red Sea. Work out at the gym and plunge into the outdoor pool. Stay active with a game of tennis, squash or beach volleyball. Simply relax in the sauna and whirlpool or with a massage at the spa. Children will love the kids’ pool and kids’ club.Host a memorable business meeting, function or wedding overlooking the Red Sea. Entertain up to 130 guests on the private beach or 220 in the Plaza Ballroom. The hotel boasts a business center, 24-hour internet café, and wireless internet access throughout. The hotel offers a vacation with a friendly and courteous service. The accommodation in the hotel is comfortable. This club resort is located on a lovely beach, a true oasis in the middle of a tropical landscape of lush gardens, flowers and palm trees. The resort’s private pebbly/sandy beach. Resort is located directly at the beach. 163 rooms, some of which are located in the newly built extension, come with individual air conditioning, a safe box, satellite TV, direct dial telephone, mini fridge and balcony with pool or garden view. Well appointed and spacious double and superior rooms are available. These rates are intended for use by European nationals. Other nationalities are subject to additional charges levied at the time of check in. The Hotel lobby is spacious, the lobby bar is open 24 hours serving all kinds of drinks.There are also some gift shops located in the lobby area of the hotel. Our pool bar offers a selection of drinks and cocktails and the a la Carte section should you wish to have a snack while sitting by the pool side. Our famous Caribbean Bar is a Casual beach bar & restaurant overlooking the spectacular panorama of Red Sea offering À la carte Sea food lunch and dinner in a tropical ambiance and refreshing tropical drinks all day, Relax and swim and don't miss joining our animation team for water sports and some fun games. Safety box in room & at reception (Extra Charge), La Luna (Italian) Restaurants is À la carte restaurant featuring creative Italian and International cuisine in a romantic indoor and outdoor dining atmosphere. In-Door Kids Club with out-door play ground. These rates are intended for use by European nationals. Other nationalities are subject to additional charges levied at the time of check in. The resort has a variety of restaurants (3) and bars (4) which fulfill different tastes. The hotel offers Super All Inclusive 24 hours including Wi-Fi in public areas, daily animation programmes for adults and children, disco club, sauna, Jacuzzi, billiard, air hockey, baby foot & table tennis, water pipe. Hotel facilities: sandy private beach, heated swimming pool with a kiddy pool, Jacuzzi, sauna, panoramic roof, kids club, mini Zoo, children’s playground, water sports, Aquapark, table tennis, billiard, football field and volleyball ground. Safety deposit boxes free of charge at the Reception. There is a clinic and a pharmacy. The doctor is available 24 hours. On the hotel area there is diving center, aqua center, shops, hairdresser saloon, internet café. Hotel is with cozy atmosphere and personalized service, multilingual personnel. The hotel is ideally located on the Red Sea shore with magnificent view of premier dive site and a beautiful coral reef with a direct access to the beach. The hotel has middle location between the city center (Sakkala) and downtown. These rates are intended for use by European nationals. Other nationalities are subject to additional charges levied at the time of check in. The Hotel is in a great location in the downtown Sekalla area of Hurghada. Just 10 minutes from the airport the hotel sits right on Papas public beach and has great views over the Red Sea and Hurghada coastline. Also next door is the brand new Hurghada marina with its trendy bars, cafes, restaurants and boutiques. The hotel is a 2 star budget hotel but offers clean, modern facilities that are excellent value for money and with its location you can't go wrong. With a stay at Hor Palace in Hurghada (Village Road), you'll be 8 minutes by car from Hurghada Grand Aquarium. This hotel is 6.7 mi (10.8 km) from Aqua Park and 6.4 mi (10.3 km) from New Marina. Hospital & Sayed Korrayem St. This hotel is more suited to younger people. It offers 419 rooms in total, air conditioning, a lobby, hairdressers’salon located at Triton Empire Beach and with extra charge, bar, restaurant, Internet wi-fi in lobby area free as well as laundry services with extra charge . Younger guests are sure to enjoy the playground and children’s club, located in sister hotel Triton Empire Beach Resort. The hotel is located in the downtown area of Hurghada, just 7 km from Hurghada International Airport, about 200 m from a private beach and in the middle of a huge shopping arcade. It features 2 outdoor swimming pools with a poolside snackbar, sun loungers and parasols.Massage treatments are also offered with extra charge. Guests may also take full advantage of the private pebbly/ beach located at Triton Empire Beach Resort located 200 metres away. These rates are intended for use by European nationals. Other nationalities are subject to additional charges levied at the time of check in. Montillon Grand Horizon Beach Resort located in the heart of Hurghada, conveniently close to everything the city has to offer. 7 km from the airport and at the intersection of the Old and New Hurghada, within walking distance to the central shopping street Sheraton. Enjoy your holiday with our hotels experience, Montillon Grand Horizon Beach Resort offers a variety of services to make your stay memorable and enjoyable. The hotel is located on the first line of the Red Sea. Pierce shared the luxury beach on the two halves. To the right is sandy and gently sloping entrance to the sea, to the left you can enjoy the beautiful underwater world using the mask and special shoes. In the hotel you will plunge into an unforgettable atmosphere of oriental hospitality and an individual approach to each guest of Montillon Grand Horizon Beach Resort. This beach hotel and guesthouse comprises a total of 147 guest rooms spread across 4 storeys. Fully air- conditioned, the establishment welcomes its guests into a lobby with 24-hour reception and check-out services, a hotel safe and currency exchange facilities. On-site facilities include lift access, a TV lounge and dining options, such as a café, bar, disco and restaurant. Business guests are sure to appreciate the conference facilities, whilst WLAN Internet access and room and laundry services are also provided. These rates are intended for use by European nationals. Other nationalities are subject to additional charges levied at the time of check in. The hotel features 144 accommodation units. Guests of the hotel are welcomed in the lobby, which has a 24-hour reception and a 24-hour check-out service. 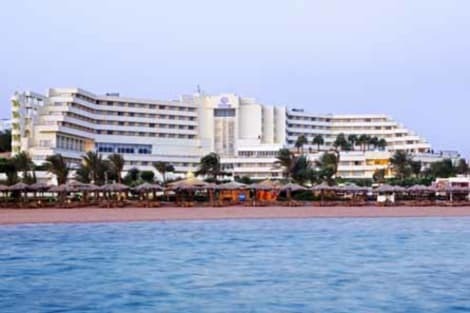 SAMRA BAY HOTEL accommodation consisting of 200 rooms. Each room was designed with extreme attention given to quality of finish and furniture, offering our guests comfort, relaxing atmosphere and a grace of elegance to satisfy the needs of the most demanding guests. The air-conditioned hotel consists of 464 rooms and suites. Guests are welcomed into the lobby with 24-hour reception and check-out service. Facilities include, ATM machine, children's playground and kids club (located in the territory of Golden 5 Almas Resort 5*), ‘Dancing Fountain Show’ For dining and drinks, guests can enjoy the on-site café, different bars, disco and restaurant. The hotel features swimming pool, kids pool with a slide and different Specialty Restaurants. Guests can also relax with the sun loungers and parasols, both in the resort and at the sandy beach, or enjoy a work-out in the gym. Some of the services offered by the hotel can be with extra charge. These rates are intended for use by European nationals. Other nationalities are subject to additional charges levied at the time of check in. The third largest city in Egypt, Hurghada has grown from humble origins as a small fishing village on the Red Sea Coast into a sprawling tourist destination famed for its marinas, natural beaches and calm waters – perfect for diving and snorkelling. Head to the north of Hurghada and you'll find yourself in Ad-Dahar, the most authentically Egyptian part of town with a bustling collection of shops, stalls, back streets and souks. Walking through the market area is a treat for the senses, with colourful fabrics and spices all jostling for your attention. If you're looking for something a little more contemporary, head south to Sigala where you'll find plenty of modern shops, restaurants and cafés. Hurghada is famous for the quality of its waters as well as the sheer amount of wildlife swimming through it. Siyul Kebira is one of the most well known destinations – exploring this underwater reef is the best place to meet species including snappers, bannerfish and angelfish. Head to the south of the nearby Giftun Islands and you'll find Gota Abu Ramada – an excellent diving spot for novice divers and snorkelers with a depth of between 3 and 15 metres. Sha'ab al-Erg is another great spot for beginners. If you have a bit more diving experience, north of the Giftun Islands is Umm Qamar, encompassing three spectacular purple coral towers and with a depth of between 10 and 27 metres. If you're looking to make a splash during your stay, Makadi Water World is a fantastic nearby waterpark boasting an array of slides, pools and places to grab something to eat. When the weather gets hot, especially during the midday sun, there's no better solution than diving into an outdoor pool or sipping cocktails in the shade. Also nearby is the Aqua Jungle Park, about an hour by car from the city centre, with a similar selection of outdoor fun. Fun for both kids and adults, you could very easily spend a whole day at either of these waterparks. If you get tired of all the water-based fun, head in the opposite direction of the sea and you'll quickly find yourself in the desert. A dramatic sight to behold, the best way to explore this area is on horseback. Pop into one of the many tourist areas in the city and book a horse-riding trip – a perfect day out whether you're travelling for a romantic getaway or enjoying a big family vacation.